Obesity and behavioral issues are two of the most common problems seen in cats. The MultiVet SlimCat Interactive Toy and Food Dispenser provides a potential solution to both problems. What is the MultiVet SlimCat Interactive Toy and Food Dispenser? The MultiVet SlimCat Interactive Toy and Food Dispenser is a cat toy that can be filled with cat treats or food. The treats or food can be retrieved by your cat as he rolls the ball across the floor. The toy provides exercise as well mental stimulation for your cat and the food inside is incentive for your cat to interact with and use the toy. 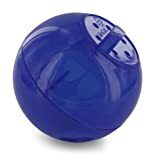 The MultiVet SlimCat Interactive Toy and Food Dispenser is made of a durable type of plastic that stands up well to use. It is also dishwasher safe for easy cleaning. I have used this toy for my own cats who really seem to enjoy it. The toy seems to dispense food better on a solid surface as opposed to a carpeted surface. It does work on carpeting as well but does not roll as easily. Who can benefit from the MultiVet SlimCat Interactive Toy and Food Dispenser? The MultiVet SlimCat Interactive Toy and Food Dispenser is a good choice for any cat. More than 50% of the pet cats in the US are said to be overweight (and my experience as a veterinarian bears out this number as well.) The MultiVet SlimCat Interactive Toy and Food Dispenser encourages your cat to burn calories while working for his meal. The toy can be a very effective means of increasing your cat’s exercise and helping to control his weight. In addition, the MultiVet SlimCat Interactive Toy and Food Dispenser also provides mental stimulation for your cat as he works to retrieve the food and play with the toy itself. This stimulation helps relieve the stress that accompanies boredom. In other words, the MultiVet SlimCat Interactive Toy and Food Dispenser keeps your cat from becoming bored and, as a result, can help control many of the behavioral and medical issues that are known to be caused by stress. If you feed a strictly dry diet for your cat, there is no reason you cannot provide your cat’s entire meal every day in the MultiVet SlimCat Interactive Toy and Food Dispenser. Find more PetSafe SlimCat Food Distributor Ball products on Amazon!